The lovable larrakin of the bush - the Kookaburra. 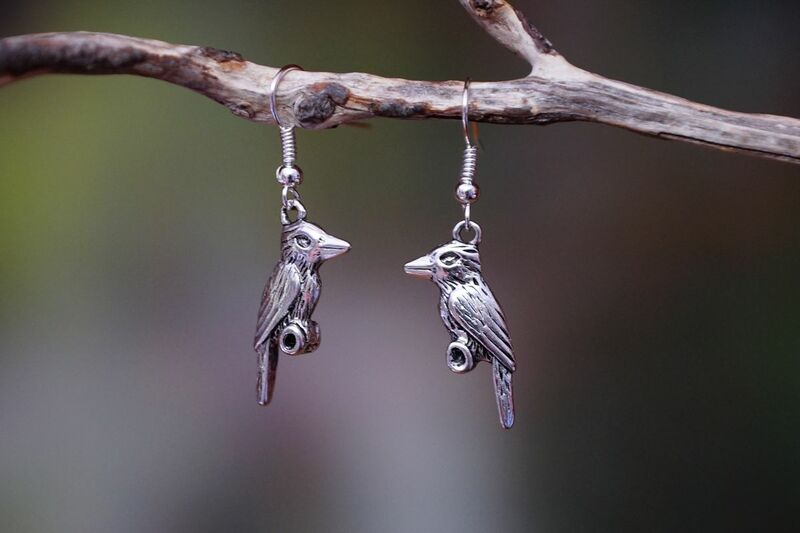 The kookaburra charm is made from Tibetan silver, the hooks are sterling silver plated and made into earrings here in Australia. These earrings make delightful gifts for friends and family here in Australia or overseas. There are two species of the Kookaburra – the Blue-winged Kookaburra and the Laughing Kookaburra and are both members of the Kingfisher family. The Laughing Kookaburra is more well-known due to its famous voice. The Blue-winged Kookaburra is found in Mangrove swamps of northern Australia while the Laughing Kookaburra is found mostly in the bushlands of eastern Australia. Hollows in trees are important to kookaburras as these make excellent homes that last them for generations. There are very strong family bonds in the kookaburra families. Often older brothers and sisters help care and raise chicks.